Franco Reyes, frontman of the band FRANCO, moves on still carrying the name of the band he has been known for and mounts his first major solo concert to coincide with the release of SOUL ADVENTURER, his new album under MCA Music. 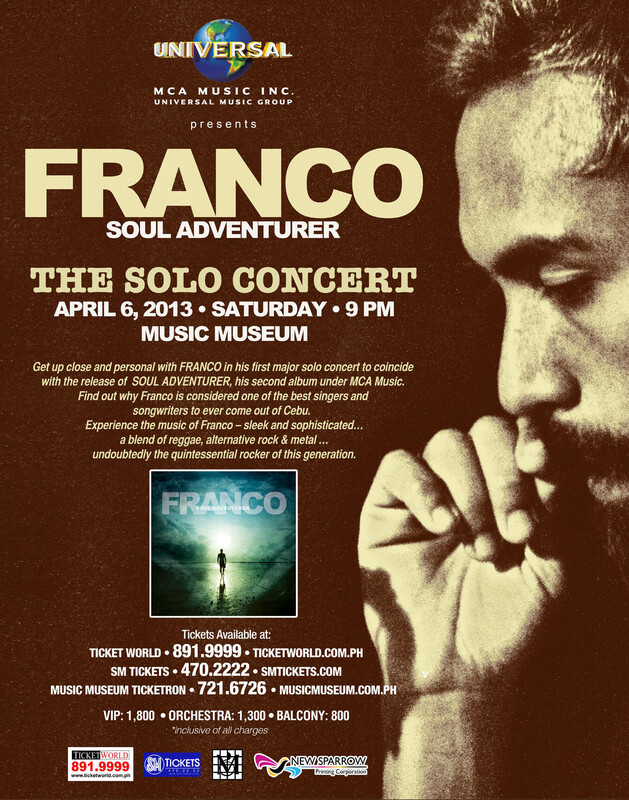 Get up close and personal with FRANCO in an intimate setting at the Music Museum. Find out why Franco is considered a musical genius and one of the best singers and songwriters to ever come out of Cebu. Experience the music of Franco – sleek and sophisticated…a blend of reggae, alternative rock & metal …undoubtedly the quintessential rocker of this generation. Experience the music of FRANCO is his first full-length major production. SOUL ADVENTURER, Franco’s 1st full-length album is now available for download on iTunes and www.mymusicstore.com.ph. Released exclusively by MCA Music. PEACE LOVE & ROCK n ROLL!